A couple of weeks ago was an eclectic one in terms of food. The two highlights for different reasons were indulging in a spot of afternoon tea at Island Shangri-La, and trying some of the new dishes on the Cathay Pacific inflight menu, with a peak behind the scenes of preparing over 70,000 meals a day. Afternoon tea, despite its finery and china, is a hard-fought market for hotels and restaurants… there is a lot of competition. 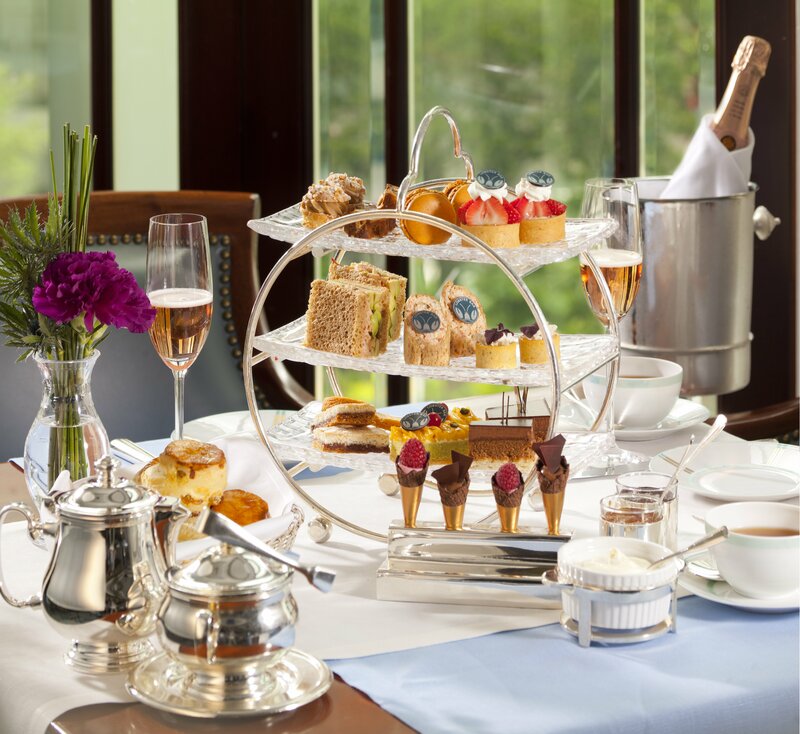 With an eye on taking some of the shine out of the famous afternoon tea at The Peninsula, and its nearest other five-star option, Mandarin Oriental, is Island Shangri-La. It launched its weekend “Lobster Afternoon Tea” at the Lobster Bar and Grill in July. Lobster appears in four savoury forms: Rye bread and marscapone roll with lobster, Crispy cones with lobster tartare and caviar, Barbecued lobster and truffle bun, and Lobster and avocado sandwich. The best by far was the sandwich as the taste of lobster shone through and the avocado was a good match for the sweet richness of the crustacean. The oddest was the bun — a play on the traditional barbecued pork bun, the filling (which had no discernible truffle flavour) was lost in the sweetness of the bun itself. It was intriguing but I couldn’t decide if it was sweet or savoury, maybe it will appeal to the local palate, as it did to my companion who grew up in Hong Kong who liked it, saying it took him down an elevated memory lane of sticky bun shops and Bo Lo Bao (pineapple bun) with its two flavour profiles in one. For me it was too much of a mishmash of sweet and savoury with no clear lobster taste. The cones were borrowed from Thomas Keller’s famous amuse bouche, however unlike the generous Keller there was not a lot of lobster and if not eaten first (no advice to do so) can lose its crispy edge. The roll was nice enough but the balance of lobster to marscapone was off, which detracted from the lobster being the star. On the sweet side there is a selection of eight items including the standout signature Frou Frou cake, a deliciously rich dark chocolate cake with a crispy (reminiscent of rice crispies)biscuit base that texturally is a perfect foil for the creaminess of the chocolate. Also good was the complex Raspberry Marechaux and the moist Mango pistachio tart. The scones with clotted cream and two jams, were enjoyable, but were almost an added extra taking a back seat to both the sweet and savoury options. What makes the experience is the addition of bubbles, and the wonderful pianist, in this case Veuve Clicquot Rosé Champagne ($788 for two including a bottle of champagne, or $428 without; $238 for one). The price also includes coffee or tea. A complete counter to this was the media tasting of new signature Chinese dishes that Cathay Pacific have introduced across business, premium economy and economy. A bus load of journalists were trucked out to the catering operations at the airport for lunch followed by a tour of the catering kitchens. After a multi-item starter and soup normally served in first class it was on to four dishes from the new items: Steamed cod with preserved mustard greens and Chinese olives, Braised pork “lion head” (meatballs), Braised beef tendon in chu hou sauce, and Hong Kong style curry chicken. The first two dishes were from business and were enjoyable enough, although the fish was overcooked and the meatballs nothing spectacular. The latter two dishes are being served in economy class. Beyond wanting to introduce a sense of home to onboard dining the dishes have all been designed to be of restaurant quality, however the inspiration, and it seems quality level, of these two dishes came from a Cha Chaan Teng. I was hoping the airline would have upped the ante a little, even for those in cattle class, but no. While both dishes tasted as they should, especially the curry with that distinct taste of Koon Yick Wah Kee curry powder, they also tasted like economy class food, disappointing. Why am I surprised by this? I thought as the food was prepared fresh, it was eaten on the ground with our full tasting faculties, and it was for a media lunch, that it would have tasted better. I once went to an onboard tasting for a rival airline and the food was so good I was blown away and it would have been enough of a basis to fly the airline if I was heading somewhere it went. 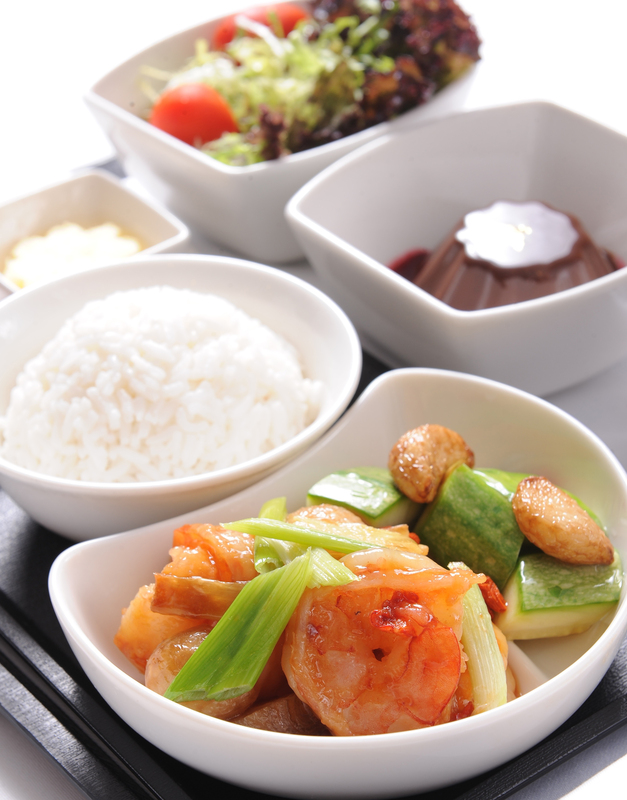 So while these new dishes may bring the flavour of Hong Kong to locals and visitors they won’t be winning my vote for best airline food anytime soon. Other new dishes include Slow cooked pork belly with preserved Hakka mustard greens, Wok-fried chicken with black bean, and Braised minced pork with eggplant in mild chilli sauce. The most shocking part of the day (for me) was the behind-the-scenes tour of the kitchen facilities. On the plus side there is a big focus on hygiene as we had to don white coats and head gear, wash our hands and brush our clothing, so that there was no chance of a stray hair or other body matter falling into the food. On the negative the vast size of the operation (an average of 65,000 meals per day across 39 airlines) means that assembling the meals is a real production line affair, with many of the staff appearing to be on autopilot. No wonder airline food tastes as it does, there is no love, no heart, no soul, no passion, in the dishes. One of the most sublime dishes I ever had was a tomato soup made with such love and passion by the chef that its perfection in appearance and taste almost made me cry tears of joy, I could taste all the emotion that had been poured into the soup. It is the complete opposite here, and that is what you taste in the food, a complete absence of heart. Due to the large scale there is little that can be done to change this, but at least I have a deeper understanding as to why economy class airline food in general is such a joyless dining experience. Apologies for the quality of the images used in the slideshow, time for a new camera. I just like the valuable information you provide for your articles. I will bookmark your blog and take a look at once more right here regularly. I’m quite certain I’ll be informed lots of new stuff right right here! Good luck for the following! Thanks Manie, appreciate the support.